soccer boy © Corbis.com All rights reserved. He’s the player whose shorts are hiked too high. He’s the one running in a little circle, maintaining his “position” as the game rages on the other side of the field. He’s not the mighty Kyle who can fire it past the goalie from 18 yards out. He’s not speedy William who can run down any opponent. He’s the kid who the coach always puts at left fullback, so he’ll be out of the way. I didn’t understand. Why does he play? He never practices. In fact, he never touches a ball after the season mercifully ends in December. When I offer to kick with him, he shrugs and says he’d rather play his clarinet, or read Harry Potter. None of his friends play. The soccer ball we buy in September sits unused in the garage during the winter months, slowly deflating, finally ending up in the trash. And yet, year after year, he signs up. And year after year, I watch him enthusiastically churn onto the field of play and I hope this will be the year that his body and mind synchronize and he becomes a master of the game. But year after year, it’s the same. The whistle blows and his teammates whiz around, stutter stepping, turning the ball sharply, shooting on goal while my son occupies his lonely corner of the field, singing to himself, identifying birds flying overhead, occasionally asking the official how much time is left in the half. When the ball finally comes to him, it dies at his feet. He stands over it, paralyzed, unsure what to do. I watch him from the sidelines, all of my accumulated hope gathered in a tight ball in my jaw. I hear the coach yell at him to pass. I hear parents whisper, “What the hell is he doing?” I see his teammates glare at him. Finally, he pulls his foot back to kick it and time pauses. The world stops rotating. Rapid heartbeat fills my ears. A thousand years pass as his arms flail for balance, his tongue juts out of his mouth and UGH! His toe catches the grass and he harvests a divot the size of knee sock. The ball never moves. But the hard part for me is not his lack of ability; it’s watching him march bravely onto the field of battle knowing that his generosity, his ingenuousness, his lack of cunning is going to get him trounced, humiliated, and yelled at. I knew that when Kyle scored a goal, my son would run over to the scrum of celebrating players, his hand held out for skin, and he would be ignored. In the eyes of his teammates, he wasn’t a teammate, he was a liability foisted on them by AYSO’s “Everyone Plays” rule. Those humiliating moments brought to mind the anguishing days I spent on the playground, waiting to be selected for a pickup softball or football game. I was always the last one picked. “Okay… I guess we’re stuck with Harper.” How that stung. And here was my son, putting me through it again. So, before I sent off the registration forms, I gently asked my son if he was sure he wanted to sign up for soccer this year. He paused, perhaps sensing that I was judging his ability. 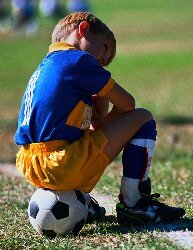 Then, without a trace of self-pity, he said, “I know I… But I don’t care what they think, I like being on a team… and I love getting the trophy.” In that moment I realized that I had spent those long soccer seasons assuming that my son was feeling the same humiliation that I felt on the playground 35 years ago, when in fact he was having an entirely different emotional experience. An experience that was entirely his own. Just as Kyle’s parents were living for his every field-bound achievement, I was dying for each of my son’s “failures.” In fact, my pain is not my son’s pain. For his own reasons, independent of my implicit judgement, my son has decided that soccer is his game, and he’s going to stick with it. And that’s what makes him a star.